As we arrived early evening we were told that we wouldn’t be able to explore any palaces or museums as everything shuts down pretty early! 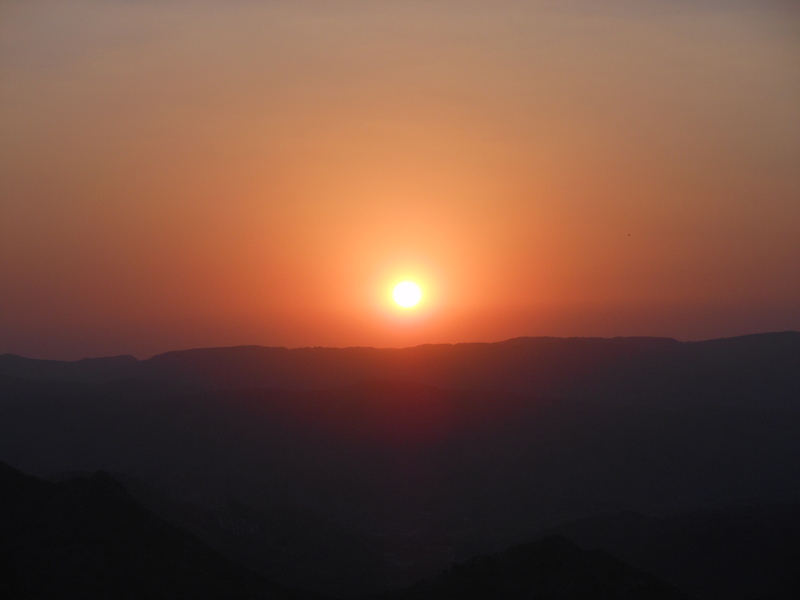 However, we were told we could still visit Sajjan Garh – Monsoon Palace, which provides a beautiful view of the sunset. And, we saw this Sajjan Garh palace is built at the top of Aravali hills and is now under the control of Government of Rajasthan. 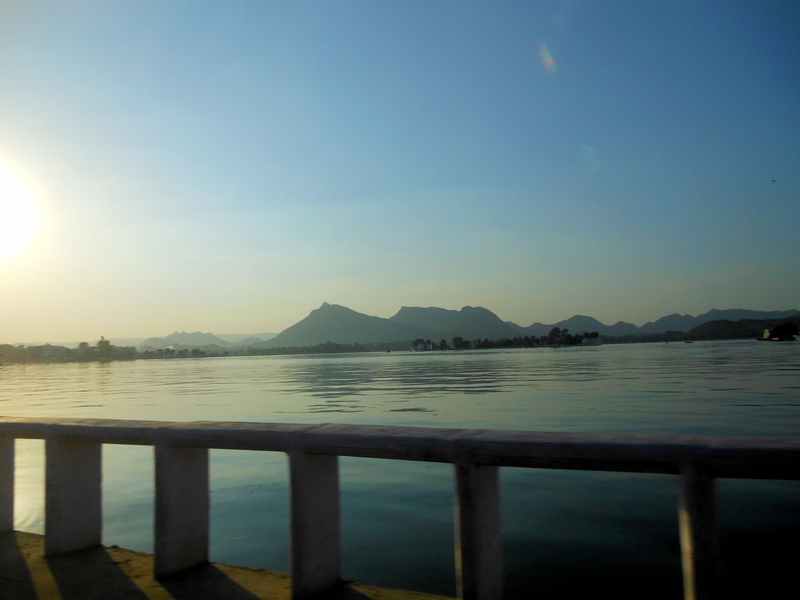 On our way back, we drove around Fateh Sagar lake. 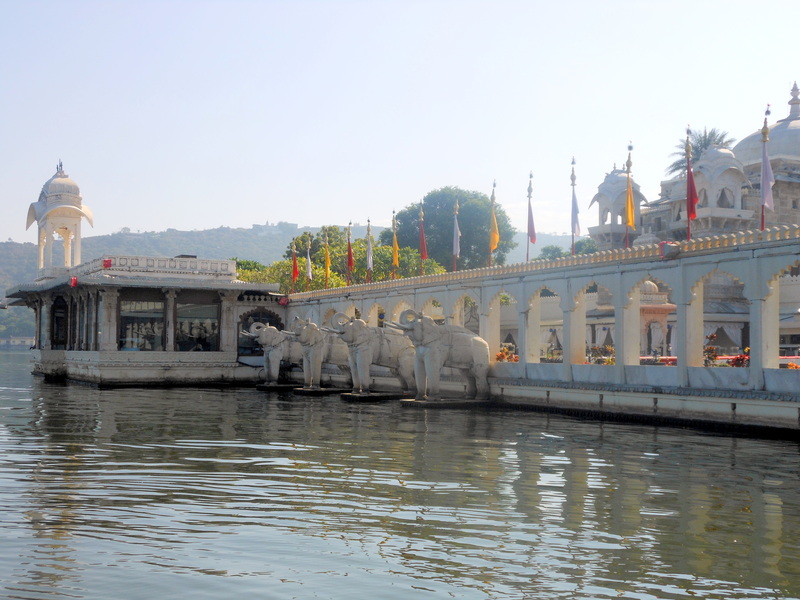 I was surprised to learn that it is one of the four artificial lakes of Udaipur. Constructed in the seventeenth century, the lake has undergone restoration many times and is one of the sources of drinking water to the city. 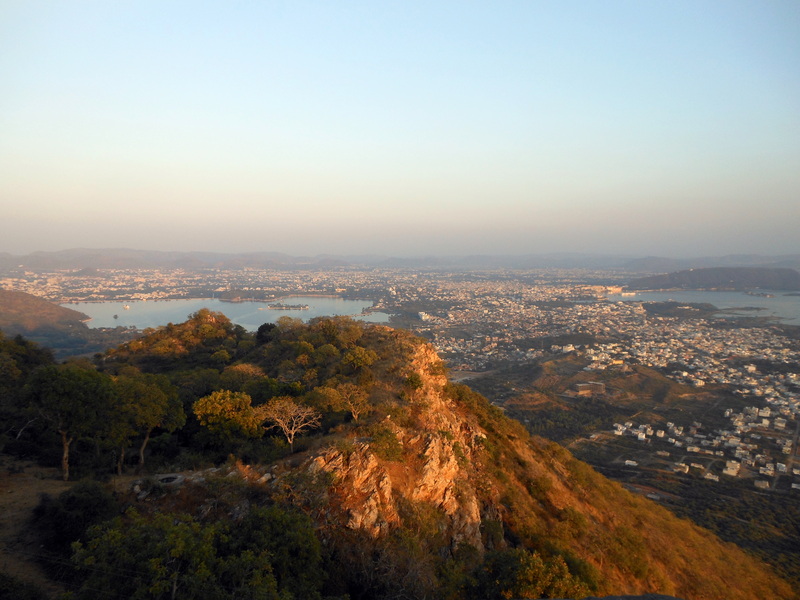 Surrounded by Aravali hills, monsoon rains are the main source of water to the lake. All four lakes are interconnected which helps retain large water capacity. Brilliantly planned. Isn’t it? 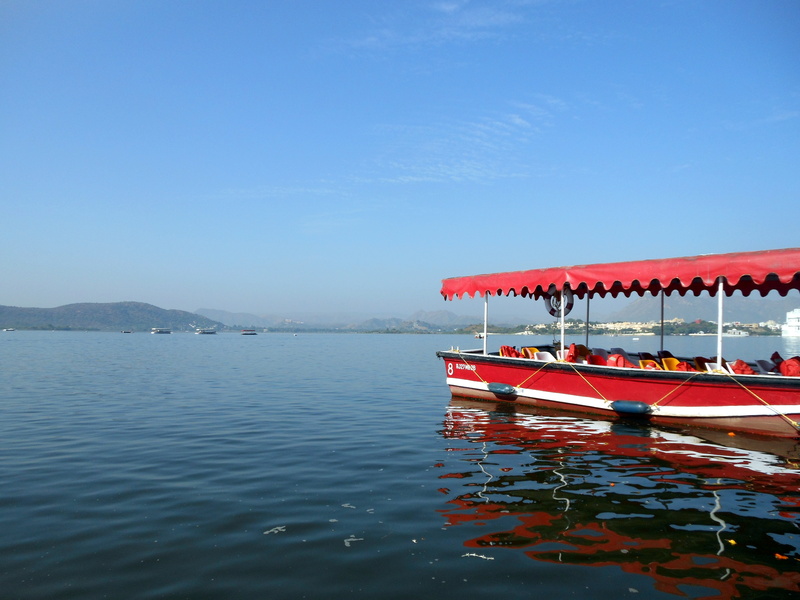 The following day we started our Udaipur exploration with the popular attraction – boat ride in Lake Pichola. 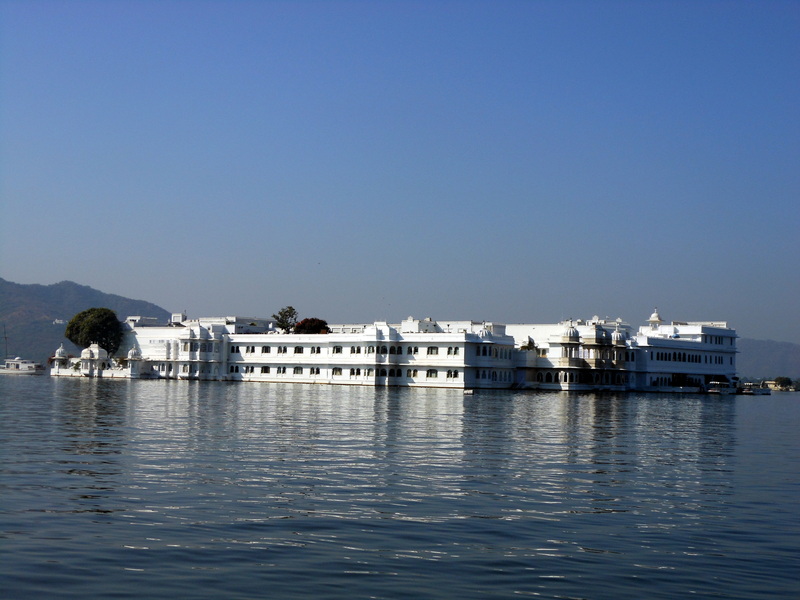 The lake has many water-palaces which are now heritage hotels, run by Leela, Oberoi and Taj group of hotels. Boat is the only way to reach these hotels. We were told many celebrity wedding also known as ‘Shahi Weddings’ happen here and the palaces and ‘Havelis’ have been used in many Bollywood movies. Boats dock at Jag Mandir, where the tourists are free to explore the palace. 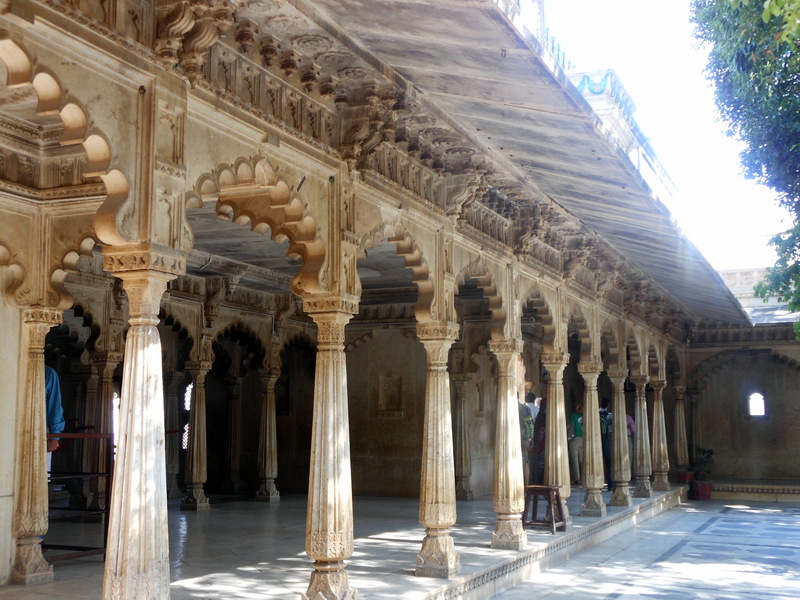 Emperor Shah Jahan resided in the Jag Mandir palace for some time while in revolt against his father Jahangir. During Sepoy Mutiny several European families were lodged and entertained in this palace. We took a boat back to City Palace from here. 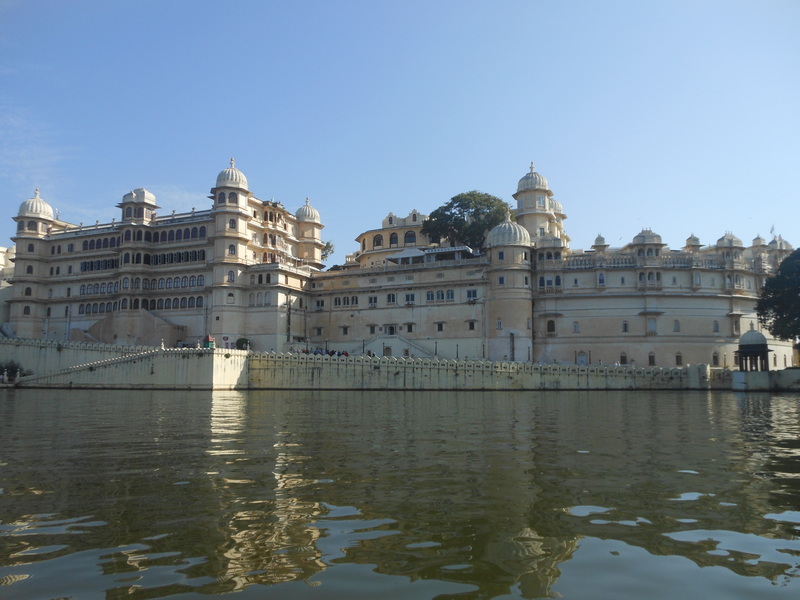 Udaipur’s City Palace is a complex of many palaces. 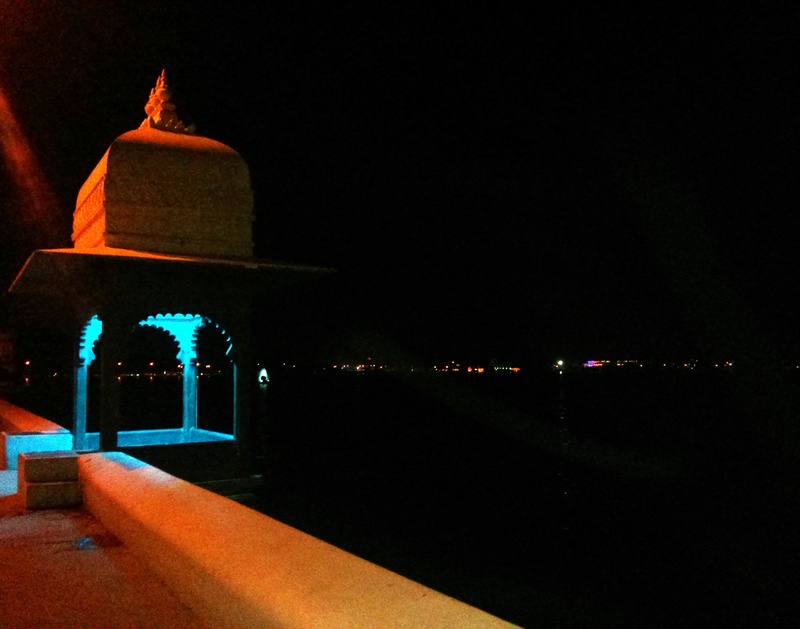 It stretches along the shore of Lake Pichola. Much of it is a museum, spread out through several palaces. The museum has interesting exhibits of lifestyles of the kings of Mewar, different apartments reserved for different occasions within the palaces, their wardrobes, accessories made of silver and gold, the first kerosene run pedestal fan, first western toilet. Mardana or palace for the royal men and Zenana or the women’s quarters, varieties of buggies, musical instruments, an exclusive exhibit of Chetak, the valiant steed of Maharana Pratap, emblems and flags of the yesteryear, paintings depicting the different battles fought by the kings of Mewar, the royal wedding set up etc. 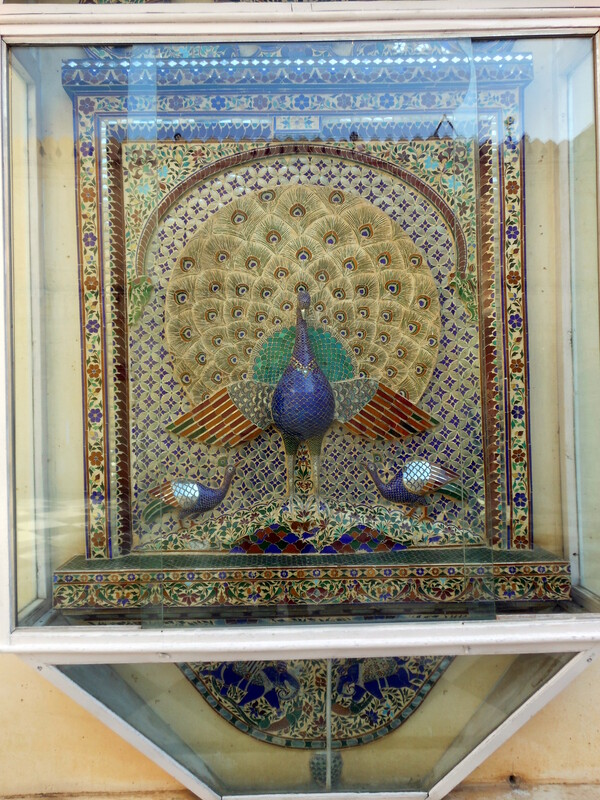 The most spectacular courtyard of the palace is Mor Chowk or Peacock courtyard made of glass mosaic. 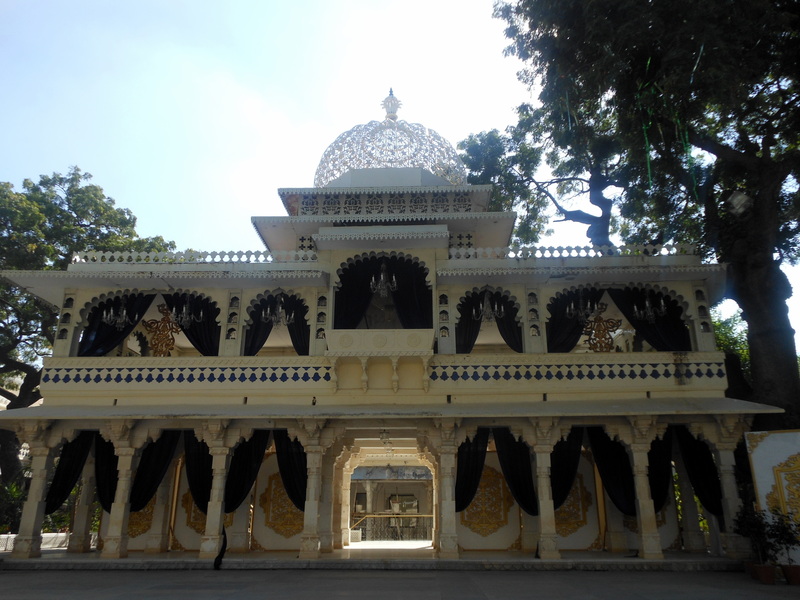 Udaipur’s City Palace also hosts many lavish palace weddings. An elegant temple of Lord Jagannath is located near the city palace which is constructed in Indo-Aryan style with intricate carvings of Lord Vishnu. We spent a good four hours in the palace complex and headed to Saheliyon-ki-Bari before calling it a day. Saheliyon-ki-Bari is a garden consisting of lush green lawns, very old and huge trees, lotus pool, marbled elephants and a variety of fountains. This garden used to be a relaxing spot for the royal ladies and their female companions and that’s how the garden got its name. The main thought behind the fountains of this garden was to form an illusion of rain. If one intently listens to these fountains with their eyes closed, one of the fountain does sound like a drizzle and the other like a heavy downpour. 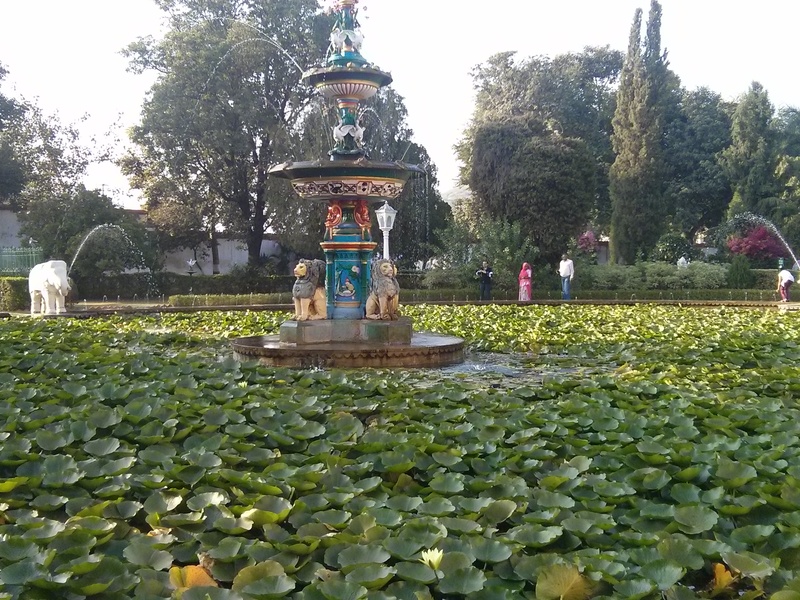 Source of water for this garden is Fateh Sagar lake. It is very intelligently set below the embankment of the lake such that water easily flows through to the garden. There is a lotus pool with marbled elephants sprinkling water, which looks like elephants splashing water through their trunks. That was our last stop in Udaipur and now we know why the city is nicknamed as the city of lakes but why is it also called as White City? 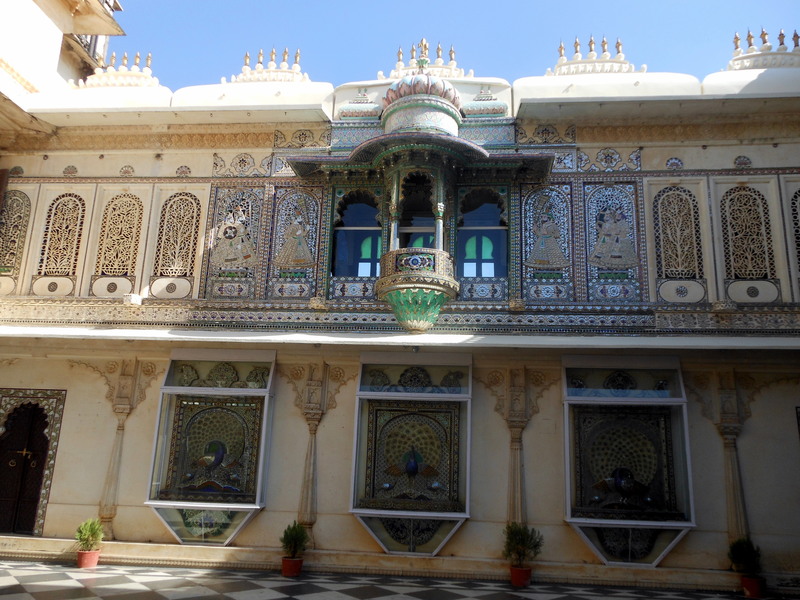 Some say it is because of the many marble palaces built-in and around the lakes, some say it is because of the Makrana marble trading and marble handicrafts. Whatever maybe the reason, if you ever plan to tour Rajasthan make sure you pay a visit to the most romantic city of Rajasthan – Udaipur!